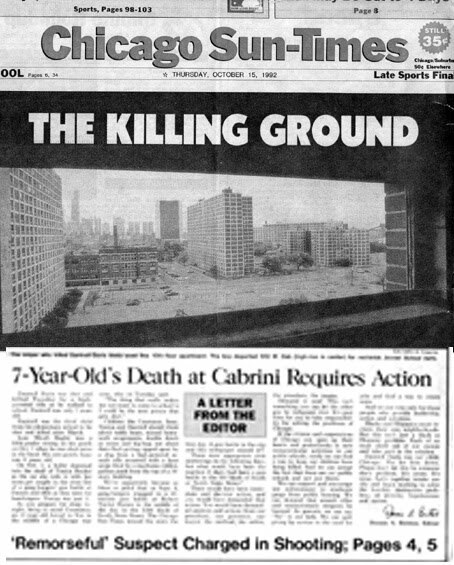 This story in the Chicago SunTimes shows that two years following an April 2008 weekend when 40 people were shot, and 7 killed, almost no one has gone to jail as a consequence. Now, here's the real reason. Not enough people who don't live in these neighborhoods care enough to get personally involved to change the schools, the poverty, the elected leadership, and the funding for programs that might change the culture of hopelessness that contributes to this urban warfare. I promote volunteer involvement in non-school tutor/mentor programs because it's an entry point for many people who don't live in poverty to begin a life time of service to change the future for those who do. For a volunteer to be involved, there needs to be a well-organized program to support that involvement. For a volunteer to stay involved for multiple years, the program where they are involved needs to sustain a high level of support for the student and volunteer. At Cabrini Connections we describe what we're trying to do in our Success Steps strategy. As we enter the 2010-11 school year, there are too few volunteer-based tutor/mentor programs operating in Chicago. 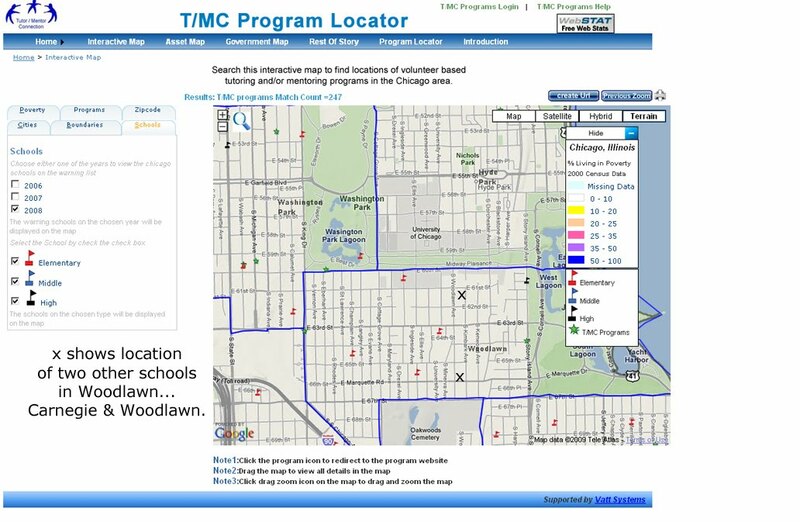 Use the Interactive Program Locator to build your own understanding of how many tutoring and/or mentoring programs there are in the neighborhoods where the most shootings are taking place. Sort the data on our maps, by age group served, to get a better understanding of how few programs there are for older youth. Visit some of the web sites that we include in the Chicago Program Links section to see how they differ in what they do, and how well they show what their purpose is and what they are accomplishing. 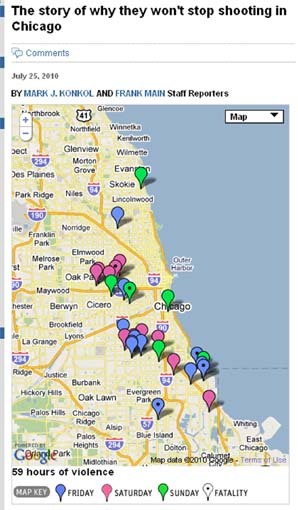 Then, try to find a resource that shows who is funding the general operations of tutor/mentor programs in Chicago. What companies, churches, social groups and foundations are providing flexible, year-to-year, operating dollars to more than 10 of these programs each year? What companies point to our database of programs and encourage employees to choose one or more for workplace fund raising donations. Who is sponsoring events like the August 29 Tutor/Mentor Jam concert to help us attract more volunteers and donors to look at this information? If you can find this information, send us the link so we can share it with others. You can't find this information on the Tutor/Mentor Connection web site because we don't have the money to answer the many questions that need to be answered, and to do the on-going market analysis that would enable all of us in the Chicago region to have a better understanding of what tutor/mentor programs are available, where are they, what are the ideas that can be duplicated, where do we find staff to lead these programs, etc. We barely have enough money to maintain the web sites and offer the Program Locator as a FREE service to people in Chicago. We are constantly looking for donors to keep our own Cabrini Connections program in place. Yet we've managed to do what we do for past 17 years. Imagine how much more impact we might have if we had a few more people helping us. They won't stop shooting until a lot more people get involved, in a lot more significant ways. Our public education system is broken, but fixing it is possible. That’s the message of Waiting for Superman, a new documentary that I went to see last Wednesday night in Chicago. I think a lot of people will become emotionally moved by watching this movie. The film's creators hope that leads more people to get involved in public education issues. To me, “Waiting for Superman” was 90 minutes of “preaching to the choir” showing the costs of poverty, the costs of prison vs education, the impact on the American economy caused by our education system falling behind those in other countries. Its conclusion was “better teachers” are needed. If you visit this section of the Tutor/Mentor Connection library, you can find links to many web sites with more information on poverty, poorly performing school, the drop-out crisis, etc. I’ve been reading articles like this for the past 35 years. Why? Because I became personally involved with an inner city boy as a volunteer in a non-school tutor/mentor program and I stayed involved for the past three decades. The longer I became involved, the more I was exposed to articles about poverty, and the more personally committed I became to helping the kids I was working with. Because I was leading a program, not just serving as a tutor, I had to step back a level, and think of ways to recruit kids and volunteers at the beginning of the school year, and keep them connected to each other throughout the year. Because I was a volunteer with limited time, I had to innovate ways to motivate other volunteers to share part of the leader load. 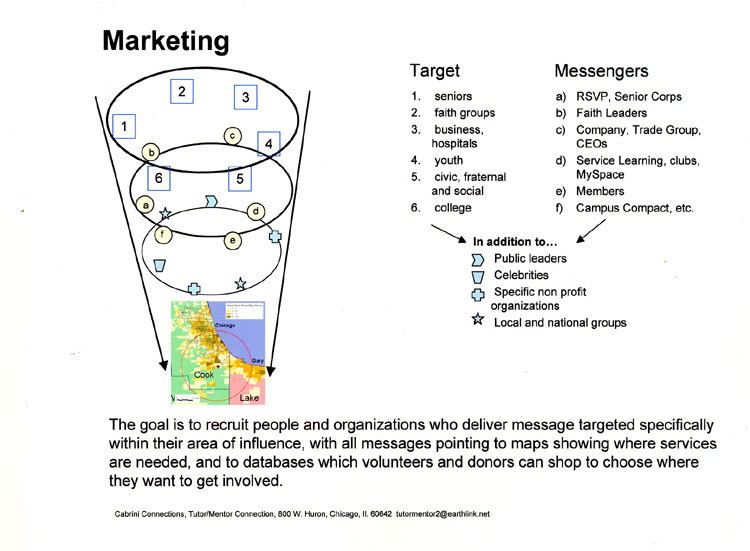 Because of my workplace experiences in corporate advertising at the Montgomery Ward Corporation, I began to understand how mass communications could be used to support groups of 200 or more volunteers. I began to understand how computers could be used to build attendance sheets and to analyze participation patterns. I also began to see how media coverage of poverty might draw a lot of attention for a short time, but it did not provide the type of consistent support that retail stores need to build a customer base, and that non profits need to build a volunteer and donor support system. I would not have been at Waiting for Superman if I had not been part of a non-school tutor/mentor program and if I had not been using the internet to connect people involved with tutoring/mentoring in Chicago with similar programs in other cities, and if I were not building a library of information that people could use to become better informed of ways they could become involved to help kids from poverty move through school and into jobs. After I saw the movie, I visited the Waiting for Superman web site at http://www.waitingforsuperman.com . I encourage you to do the same, and then take a group of friends to see the movie. In this section the message is “act locally”…meaning support your local school. This is good advise, but it won’t do much to change the performance of inner city schools located in high poverty neighborhoods unless more people from beyond poverty are giving time, talent and dollars every day to help people who do live in poverty neighborhoods. This is one of the shortfalls of the movie that I saw. Most of the young people portrayed in the film were minority kids living in inner city neighborhoods of big cities like LA, Houston and New York City. The kids featured in the movie attend public schools in poverty areas, and have a parent, or guardian, who would pay for better education if they had the money. They might also do more to show kids the importance of college, if they had a college degree themselves. But that’s what poverty is all about. It’s people who don’t have high paying jobs, college degrees, etc. How can they be providing the dollars to help teachers? How can they find the time to be mentors? How can they model jobs and college if they have not finished school themselves? The solutions proposed in this section don’t show how people who don’t live in high poverty might be personally involved in helping youth and families who do. 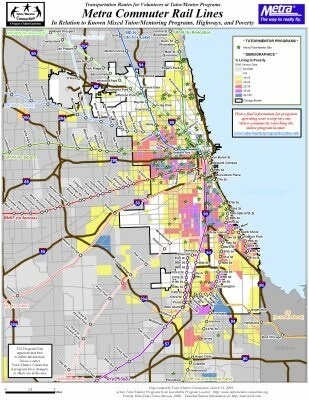 The actions proposed don’t take in consideration the geography of poverty and poor schools and don’t provide a road map for Superman to go from neighborhoods of affluence to neighborhoods of poverty. This section does include a “be a mentor” link that points to the web site of the National Mentoring Partnership. However, it does not say “be a donor” so more mentoring programs might have the staff and infrastructure to add more volunteers, and provide high quality mentoring to those they already have. This is a missed opportunity in my estimation. This is the second section in the Take Action section. There are links in this section that focus on education standards, the Dept. of Education Race to the Top competition and getting involved with a local school board. There is also a link to a Dept. of Education Innovation Portal, where anyone can submit ideas and connect with others who have submitted ideas. This has potential. I introduced the Tutor/Mentor Connection and posted a request for help in funding our maps and technology. I’ll let you know if I get any responses. There’s also a section titled “Join a discussion” which points to the Edutopia community forum where people can join in discussion with others on education issues. I also joined this forum and introduced myself. I did not see any section that was focused on helping non-school organizations be available around poorly performing schools, so I emailed Edutopia to suggest they add such a section. In total, I think Waiting for Superman has a lot of potential for increasing the number of people motivated to "fix the public education system", but the web site is missing some major opportunities. I think there are a broader range of web sites where you can learn more about the problems of our education system, and the poverty causing some schools to perform less well than others, and potential solutions. A starting point in your learning would be the Tutor/Mentor Connection library, where we point to more than 1600 resources such as these in our Research and Resources category. Volunteer involvement, expanding the number of people who personally care. I think the movie, and the forums, are efforts to engage people who care in discussions and actions that lead to solutions. However, these don’t provide enough entry points to get adults who don’t live in poverty personally connected with youth and families. 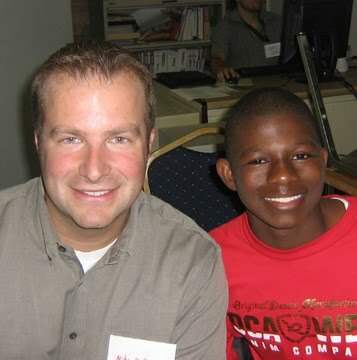 In a recent study titled "Untapped Potential: Filling the Promise of Big Brothers Big Sisters and the Bigs and Littles they Represent, the authors point out how there were more than 240,000 active BBBS volunteers in 2009, and that many of them have become more concerned about the challenges facing the kids they mentor, because of their involvement as a mentor. Thus, strategies that encourage more volunteering in well organized volunteer-based tutor/mentor programs would be ways to increase the number of people watching movies like Waiting for Superman, and spending time to “fix the system”. However, for that to happen a more consistent flow of operating dollars needs to be going to every single program so they can recruit and retain leaders who can effectively mentor the mentors so they stay involve, build this level of empathy, then grow to be leaders who reach into their own business, alumni, faith and personal networks to get even more people involved. This is what the Tutor/Mentor Connection focuses on. We're not yet listed as one of the resources on the Waiting for Superman web site. We're not yet invited to any planning meetings by CEO Ron Huberman of Chicago Public Schools. We’re not on their radar. However, that can change. If you know about our work, or read this blog, pass on this message to leaders in your own network, the way Sara Caldwell did on this web site. We can bring supermen and women to inner city neighborhoods by what we do to encourage people who have the talent and the resources to help this strategy grow in Chicago and other cities. Thank you to Waiting for Superman for helping draw attention to this issue. Parents Support Tutor/Mentor Program. Can you? This video shows to of the parents of Cabrini Connections' students, talking about the mentors working with their kids. If the parents support the program, can you become a donor or benefactor who does the same? Year-End Dinner 2010: Parent Speakers from Cabrini Connections on Vimeo. See the Donor Page on the Cabrini Connections web site to see ways to contribute. Visit the Tutor/Mentor Jam web site and see ways you can help us support the growth of tutor/mentor programs in all poverty areas of the Chicago region. At the end of every day, look in your personal mirror and check of what actions you took. If you document actions, you can review what you’ve done at the end of each month, and each year, and begin to see a growing mountain of actions you have taken to solve this problem. Some of these will be actions that got other people involved, so that the good work you do is multiplying because of the good work others are also doing. Just read this article in the New York Times: Graduation Is the Goal, Staying Alive the Prize. This article talks about the muti-million dollar program launched by Chicago Public Schools to "get ahead of the next killings". According to the article, "the schools conducted an analysis to identify the 250 students most at risk of being shot (by studying profiles of 500 recent victims). Since December, each of those students has had an advocate on call to offer caretaking and support 24 hours a day, seven days a week. The 60 advocates hired so far function like a high-energy amalgam of parent, tutor, friend and life coach, sometimes tackling simple assignments like homework. But more often they delve into the heart-wrenching details of the students’ lives. More than one has sat bedside in a hospital emergency room after bullets ricocheted through a charge’s body." This is great if the money is there to keep these advocates connected to these kids for the next few years. 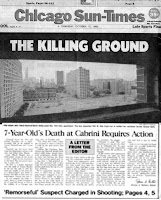 The Times article quotes Ron Huberman, CEO of Chicago Public Schools, who says, “Giving them a meaningful adult relationship, advocating for them and giving them incentive is the key to changing their behavior, since some of the students most at risk of being shot are also most likely to perpetrate violence." According to the report, "Each advocate is assigned no more than four students and is paid $12 an hour for one-on-one time with the students." 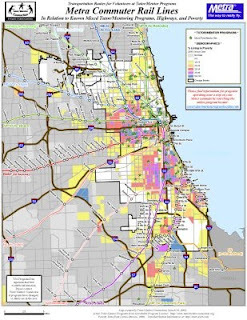 There are 200,000 k-12 youth living in high poverty areas of Chicago, and thousands are at risk because of this long-term combination of highly concentrated poverty, racial segregation, and poor schools. Spending millions of dollars on 250 of these students without a comprehensive plan to expand the number of other students who have “meaningful adult relationships” that Huberman describes, is short sighted. What type of skills and experiences is a $12/hour mentor/advocate bringing to this job? What networks do they have to open doors at colleges or in area jobs for the young people they are working with? At Cabrini Connections and at other volunteer-based tutor/mentor programs in Chicago, students are also connected to adults who are forming “meaningful relationships”. However, these are adults who hold a variety of jobs, ranging from high paid attorneys, to software engineers, artists and film makers. Many are already college graduates. Some hold advanced degrees. They don't live in poverty. They come from many different parts of the country. They can model opportunities and careers and aspirations for these young people, because they already have these jobs and experiences. What kind of experience does a $12 hour social worker/mentor/advocate have? Are they still connected and committed to these young people when the money runs out to pay them? Are they still connected 37 years after their first contact, as I am with the boy I met in 1973 when he was in 4th grade? Not every volunteer stays connected to a youth for as long as I have. In fact many don't stay involved for more than a year. And many are not as well supported as they need to be. Why? The non-school tutor/mentor industry has the same challenges as the public school system. Not enough good leaders. Not enough well-trained and committed volunteers in tutor/mentor roles. However, as this article shows, mentoring connects adults who might never be involved with issues of poverty, with kids, and then opens their eyes to the challenges those kids face. If we can expand the support for well-organized tutor/mentor programs, we can expand the number of volunteers who get involved, and stay involved. We can expand the number of people who are concerned about the violence in big cities and the poor schools that feed this problem. Read the articles on this blog and follow the links. Learn how you, your company and your faith group can take lead roles to help make volunteer-based tutor/mentor programs available in more of the neighborhoods with high poverty, high violence and high numbers of poorly performing schools. Then help mobilize resources for each of these programs to be operating this fall, and to constantly learn from each other, and from their own work, so they are constantly expanding their impact. If you can help find donors to support the Tutor/Mentor Connection, we can continue to provide our own vision and leadership to this effort and we can continue to provide the Chicago Tutor/Mentor Program Locator resource to everyone in Chicago. In yesterday's Chicago Tribune I saw an article about the Mayor of Chicago taking part in an anti violence march in the Woodlawn neighborhood of Chicago. One person was quoted as saying "They need to spend some resources to open a youth center here, give kids someplace safe to go." This is a map of the Woodlawn area created about a year ago. I included it in this article. It was built using the interactive Tutor/Mentor Program Locator. My purpose in sharing this is to encourage business, faith and community leaders to use the Tutor/Mentor Connection maps and ideas in their own planning. Invite us to your meetings. This section on Collaboration illustrates our goal of helping every high poverty neighborhood have a variety of volunteer-based tutor/mentor programs, supported by the people who do business in the area, or who drive through the area as they go in an out of the city. School starts in a few weeks. 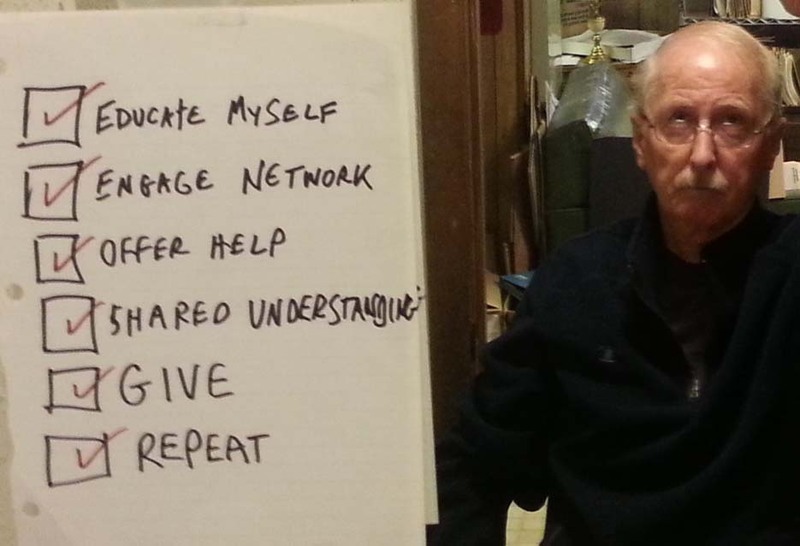 Tutor/mentor programs are looking for volunteers, and dollars, to provide their services. It's up to the Mayor, and other leaders, to use their visibility, and these marches, to draw needed resources to all of the programs that need help to continue services in 2010-11, and to all of the neighborhoods where new programs are needed. In one of the workshops at the May Tutor/Mentor Conference, media reps were criticized for mostly telling stories of bad news, and not enough of the good things kids are doing in neighborhoods. One suggestion was that on media web sites, links could point to sites like the Chicago Program Links, which host nearly 200 web sites of youth organizations in Chicago. I was contacted by Tracy Schwartz of Red Eye this week, who was following up on that ideas. I hope it happens. However, unless tutor/mentor programs are using blogs, or some other media, to tell of the work that is taking place in their organizations, this strategy won't have the intended benefit. At Cabrini Connections, Tutor/Mentor Connection, we encourage all of our staff and interns to write blogs. Last week we had a lot of things happening, so here are links to the stories that were written. Edgewood College visit - Karina Walker, our new Northwestern Public Interest Fellow wrote this. These stories change each week, based on what is happening at Cabrini Connections, and what is happening in the world. Each writer has a different perspective, and a different network of friends, family and alumni who will read these stories and pass them on to others, expanding the network of people who support Cabrini Connections even when the media don't point at our work. If other tutor/mentor programs learn to tell their own stories this way, we all are building more understanding of what happens in a tutor/mentor program, and why volunteers and donors should help us. If Red Eye and other media point to the Chicago Program Links, readers who are motivated to do something because of bad news stories, will find plenty of reasons and places where they can help turn bad news in to more good news. The title of this news was "RECESSION TAKING A TOLL ON NONPROFIT WORKERS AND PROGRAMS"
One statement in the summary said "Nonprofits have been stretched to the breaking point," noted Peter Goldberg, chair of the Listening Post Project Steering Committee and president and CEO of the Alliance for Children and Families. "It is crucial to take steps now to help sustain the vital work of America’s nonprofit organizations." We're holding our annual Golf Benefit tomorrow, and it's great to see that many of the golfers and sponsors are people who have supported us in past years. However, many are sponsoring at lower levels, and there are not enough new donors to help us offset losses from grants and other donors. Today was the third day of our annual 3-day workshop with graduate students from Edgewood College in Madison, Wisconsin. I encourage you to read what some of our interns and staff wrote about this. These experiences are invaluable, yet at risk because of the recession and its impact on donations. You can help change that by telling people you know to visit our web sites and see how we're not just helping kids in one neighborhood via Cabrini Connections, but trying to help kids in many neighborhoods via the Tutor/Mentor Connection. If we expand the network, we expand the donor base. We keep doing this work. I encourage you to read Bradley Troast's one year reflection article, showing what he has learned from the year he has been with Cabrini Connections, Tutor/Mentor Connection. Our goal is that many adults, young and old, go through this process of learning and reflection, and that they continue to stay involved for many years. 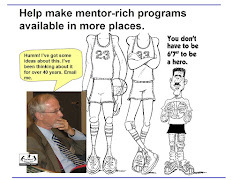 I've been involved in leading a tutor/mentor program for 35 consecutive years. That's what gives me the perspective, and the passion, that I bring to this work. This animation shows how volunteers and staff who stay involved in a tutor/mentor program for multiple years grow in their understanding, and in how they serve as leaders, to expand the number who get involved. We need benefactors who understand the value, and the potential, of a network of leaders with this depth of experience, who will provide the operating dollars at Cabrini Connections, and many other programs, to enable this. Today Chicago mourns another police officer killed in a Chicago neighborhood. According to the editorial in today's Chicago SunTimes, the wife of slain officer Thor Soderberg "took a moment to call us to a higher purpose." She said, "Here is what you can do. If you have the opportunity to do something and change someone's life for the better, do it. Start by taking care of every child. Thor and I knew that each young person needs five important adults and one strong adult to provide a positive influence in their lives. Everyone one of us can do a tremendous amount of good to impact a child, even one that isn't ours." This is what the Tutor/Mentor Connection has been saying for the past 16 years. Every child needs a range of extra adults in their lives, and kids in high poverty neighborhoods need churches, community centers, local businesses, and/or non profit organizations to provide organized, structured spaces, where those extra adults can connect, and stay connected, with kids for many years. 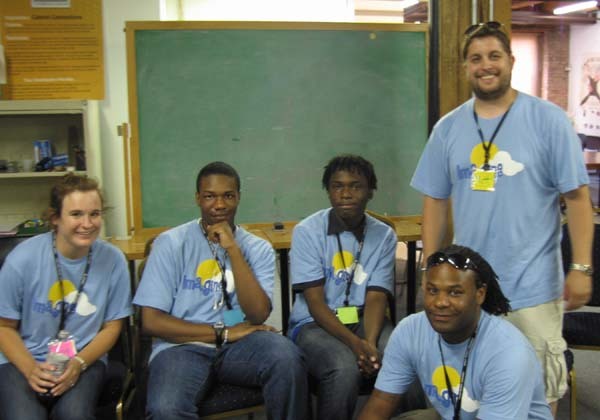 Volunteer-based tutor/mentor programs, like Cabrini Connections, and many others who have web sites in the Chicago Programs Links Library, offer such structure. However, we can't do this without more donors stepping forward to provide the money to pay for the rent, insurance, staffing, technology and other basic costs of these programs. 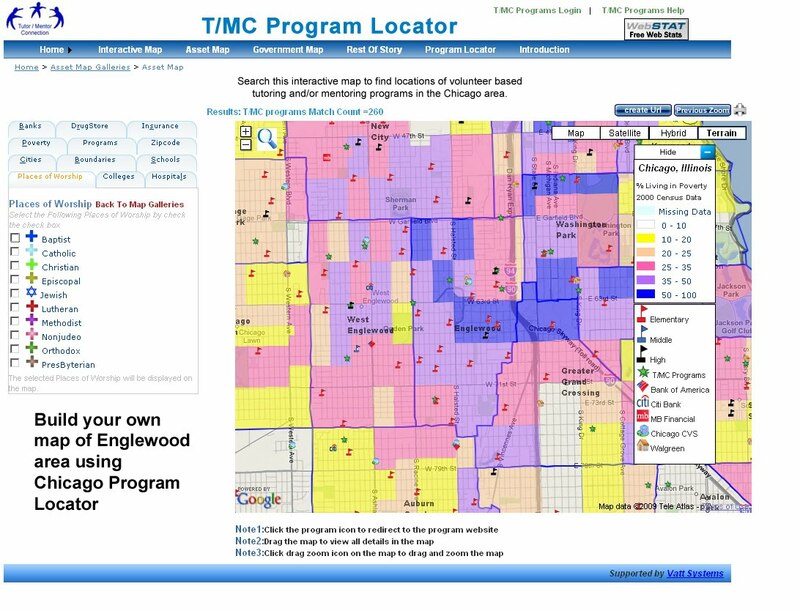 If you use the T/MC Program Locator, you can zoom into different parts of the city where there is high poverty, and too many poorly performing schools. You'll see that there are far to few places in these neighborhoods where kids and extra adults can connect. Furthermore, in many of these neighborhoods, there are too few extra adults because everyone is dealing with the impacts of poverty and violence. Thus, it's up to the greater Chicago region to respond. I encourage you to look at this transportation map, showing high way and Metra routes, linking the LOOP with the suburbs. Every day thousands of potential volunteers and donors pass through poverty neighborhoods on their way to, or from, work. Heed the call from Jennifer Loudon, wife of Thor Soderberg. The articles on this blog, and the links we point to, provide information that can be used by anyone who wants to do more to respond to this call for involvement. Form a learning group. Make time every week to read a little, talk about these ideas with friends, family, and co-workers. Then build an action strategy, and stick to it. 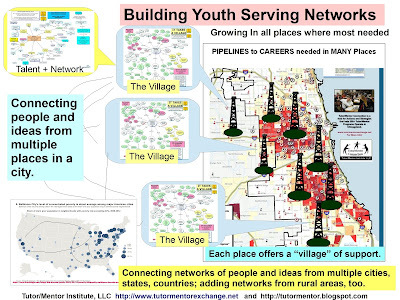 Learn more about how you, your church, your business, and/or your alumni and social group can make these networks of extra adults more available to youth in the high poverty areas of the Chicago region, and to all other youth who need extra help from structured tutor/mentor programs. Next Thursday, July 15, is our annual Cabrini Connections, Tutor/Mentor Connection Golf Benefit, which will be held at Highland Park Country Club. This event helps raise money to fund our programs, and helps recruit new leaders and volunteers who will help us in the coming school year. We're still accepting sponsors, golfers and donors and dinner guests. If you can help us, please do. We've some great items for our silent auction, such as Notre Dame football tickets, a huge TV, golf packages at The Glen Club, Olympia Fields Country Club, tickets to the BMW Golf Championship etc. And there are dinner packages at Schubas, Lincoln Hall, the Dana Hotel and Spa, and much, much more. We've started an on-line auction for those who cannot join us next Thursday. Without the help of our donors, golfers and sponsors we could not offer the programs of Cabrini Connections and the Tutor/Mentor Connection. Thank you. We have a new member on our team. She is Karina Walker, a recent graduate from Northwestern University. I've asked her to review the other articles on our blogs and see how we are visualizing strategies that help kids move from poverty to jobs. This graphic is from a blog article Karina posted today. I encourage you to read Karina's introduction article and follow her progress as she gets to know us, and begins to share what she knows with people in her own network. If you're reading this, why not map your own network, and connect those who helped you to us, or other tutor/mentor programs, so you can help future generations. Map your Network. Nudge your Network. One of the books I've read is titled Jesus, CEO. It talks about how one person, with just a few friends, and no high level connections (on this earth)was able to change the world. I'm one of those grains of sand on the beach that you never notice. Yet, my goal is to change the future for kids born in all high poverty neighborhoods of Chicago, not just the kids who participate in the Cabrini Connections program that I've led since 1993. So, without any high level friends, no wealth, and only 24 hours in each day, how can I have an impact on the world. How can YOU have an impact on your world? Below is a map of one part of my network. If you click here, you can see this live. This map shows places hosted by Cabrini Connections, Tutor/Mentor Connection, where we share our ideas and try to help people get involved with what we do. The map shows places such as Social Edge, where we participate in discussions hosted by others. It shows links to our blog list, where there are more than 100 blogs where I've shared ideas, and where smarter people than me are writing about the same issues that I care about. It shows the social media where I have friends and where I connect with many others. It also shows some of the fund raising portals where we try to raise money. I spend time every week, visiting most of these sites, posting messages that I feel add value, and which I hope will encourage people to visit the CC, T/MC sites to learn more. 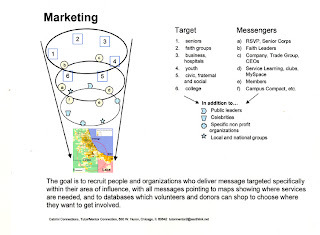 In this graphic, the goal is to illustrate a funnel, with the narrow end pointing to the information hosted on T/MC web sites. 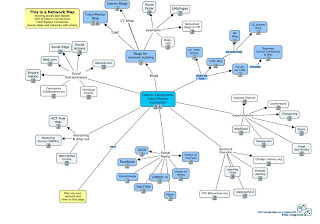 Imagine how many people in the world care about the same issues we care about, who could be mapping their own networks, and spending time every week, encouraging the people they know to look at the information we host, and find some way to help tutor/mentor programs connect with kids as part of strategies to help those kids move through school and into jobs and careers. Everyone has a network. Anyone can map their network. Anyone can nudge their network. You can have a greater impact on the world than you think, if you are following some of these ideas and pointing your network to information that they can use to support the cause you are focusing on. If you're doing this, why not share you maps with us so we can learn from you. Freedom. The Vision of a Few. Benefit to Many. As we celebrate this weekend, think of how the ideas of just a few people can change the world. This video illustrates the power of a few who are joined by many others. We hope Cabrini Connections, Tutor/Mentor Connection is a vision that has the same power.